Home / Blog / Who or Whom? Update: I’ve created a Who or Whom? Quiz to test your knowledge of this topic. Try it before you read the article! The difference between who and whom is a matter of case. 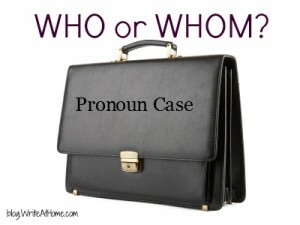 There are three cases for personal pronouns: nominative, objective, and possessive. The nominative case is used when the pronoun is the subject of a verb. The objective case is used when the pronoun is an object — either of a verb or a preposition. Possessive case pronouns are used to show, well, possession, of course. But we’ll leave possessive case alone since it isn’t important to the who/whom question. Who decapitated the Barbie doll? This is why it is correct to write “To whom it may concern” (Whom is the object of the preposition to). A note of caution: Watch out for tricky little things called predicate nominatives. Predicate nominatives usually look like the objects of verbs, but they are not. They follow linking verbs like am, is, are, and the other be verbs. Linking verbs don’t have objects. They have predicate nominatives or predicate adjectives. A predicate nominative renames the subject. If it is a pronoun, it should therefore be in the nominative case — like who. Example: The ventriloquist is who? Lots of smart people use whom in a sentence like this because it looks similar to a sentence like The ventriloquist married whom? But the fact that the verb is is a linking verb and married is an action verb changes everything. Who in the first sentence is not an object, but a predicate nominative, and therefore requires the nominative case. I ate the guacamole. = Who ate the guacamole? The guacamole ate me. = The guacamole ate whom? One final comment. As I’ve discussed elsewhere on this blog, language is always changing through popular usage. Grammar purists can only hold out for so long against the way people really talk and write. That’s why we don’t use thou, thee and thy anymore, for example. It’s also why gay means more than just happy and why nobody uses the word shall any longer. We can like the changes or not, but the language will and does change. And because that’s true, I’m predicting that the word whom is doomed. Whom feels awkward to a growing majority of American English speakers, and I don’t think there will be much resistance when dictionaries finally declare that who can be considered either nominative or objective case. It’s just a matter of time before whom is considered archaic. Thoughts on this or another topic? Please leave them below. Take the Who or Whom Quiz! My Facebook feed includes a link to a blog post, “It matters whom you marry.” I don’t care about the subject at hand, but the grammar in the title irks me. It doesn’t feel correct, yet I’m having difficulty parsing the sentence. Sorry, K, the title is correct. Of course, since “whom” is quickly going the way of “thee” and “thou,” few would notice or object if you said “it matters who you marry,” but “whom” is correctly used in that title. Thank you for working for law and order of language. I certainly wish gay still only meant happy. I was using hyperbole when I said “nobody” uses “shall” anymore, Cate. But, yes, you are in the minority. I shall address the topic of “will” and “shall” in an upcoming post. I know, the anticipation is probably KILLING everybody!